96% of World's Internet Traffic is about to take Biggest change in the history with Internet Protocol version 6 (IPv6) - You might want to read about it. Internet Protocol version 6 (IPv6) is a version of the Internet Protocol (IP) that is designed to succeed Internet Protocol version 4 (IPv4). The Internet operates by transferring data in small packets that are independently routed across networks as specified by an international communications protocol known as the Internet Protocol. Each data packet contains two numeric addresses that are the packet's origin and destination devices. Since 1981, IPv4 has been the publicly used version of the Internet Protocol, and it is currently the foundation for most Internet communications. The growth of the Internet has mandated a need for more addresses than are possible with IPv4. IPv6 allows for vastly more addresses. 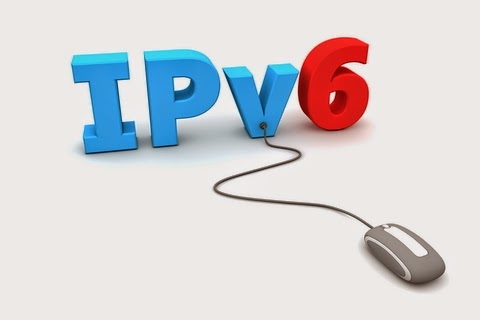 IPv6 was developed by the Internet Engineering Task Force (IETF) to deal with the long-anticipated IPv4 address exhaustion, and is described in Internet standard document RFC 2460, published in December 1998.Like IPv4, IPv6 is an Internet Layer protocol for packet-switched internetworking and provides end-to-end datagram transmission across multiple IP networks. While IPv4 allows 32 bits for an Internet Protocol address, and can therefore support 232 (4,294,967,296) addresses, IPv6 uses 128-bit addresses, so the new address space supports 2128 (approximately 340 undecillion or 3.4×1038) addresses. This expansion allows for many more devices and users on the internet as well as extra flexibility in allocating addresses and efficiency for routing traffic. It also eliminates the primary need for network address translation (NAT), which gained widespread deployment as an effort to alleviate IPv4 address exhaustion. IPv6 implements additional features not present in IPv4. It simplifies aspects of address assignment (stateless address autoconfiguration), network renumbering and router announcements when changing Internet connectivity providers. The IPv6 subnet size has been standardized by fixing the size of the host identifier portion of an address to 64 bits to facilitate an automatic mechanism for forming the host identifier from link layer media addressing information (MAC address). Network security is also integrated into the design of the IPv6 architecture, and the IPv6 specification mandates support for IPsec as a fundamental interoperability requirement. The last top level (/8) block of free IPv4 addresses was assigned in February 2011 by IANA to the 5 RIRs, although many free addresses still remain in most assigned blocks and each RIR will continue with standard policy until it is at its last /8. After that, only 1024 addresses (a /22) are made available from the RIR for each LIR – Currently, only APNIC has already reached this stage. While IPv6 is supported on all major operating systems in use in commercial, business, and home consumer environments, IPv6 does not implement interoperability features with IPv4, and creates essentially a parallel, independent network. Exchanging traffic between the two networks requires special translator gateways, but modern computer operating systems implement dual-protocol software for transparent access to both networks either natively or using 'tunneling' such as 6to4, 6in4 or teredo. In December 2010, despite marking its 12th anniversary as a Standards Track protocol, IPv6 was only in its infancy in terms of general worldwide deployment. A 2008 study by Google Inc. indicated that penetration was still less than one percent of Internet-enabled hosts in any country at that time.